I entered it again this year just to redeem myself after having pulled out last year in the fourth lap because I was hurting too much and in the cold was feeling totally miserable. Now a lot of people don't like the idea of a five laps around the Town Moor, but the first time I did it I changed my mind. It's not a simple circuit right round the edge of the moor, but a convoluted course with lots of fingers where runners pass each other going in the opposite direction, so great for cheering each other along and shouting words of encouragement. Conversely, it's all too easy to pull out at the end of any lap like I did last year. Greta and Debbie were our support/cheering team and set up station on one of the loops where we would pass them in one direction and again on the way back. They proudly displayed the Striders flag (the old smaller one, not the huge big new one which we unveiled the previous day at the Harrier League. Which was probably just as well or it would probably have ended up in South Shields in the strong wind. Dave Robson was marshaling this year and his station was on one of the other loops so we passed him twice on each lap and got loads of encouragement. So, lining up on the start line were Anna Seeley, Phil Owen, Andrew Thompson, Magggie Thompson and me. Rather than going off too fast as usual I kept a respectful distance behind Anna, knowing she would be going at a more sensible pace (two years ago I passed her after the first lap, only for her to come sailing past me in a later lap when I'd run out of steam and finish 20 minutes ahead of me). But this year by the end of the second lap she wasn't feeling too well at all and I got past. Then half way into the third lap I spot her and Greta who had donned her running shoes to give Anna a bit of a boost round. By the end of that lap the support crowd by the Strides flag had been swelled by Bill and Jill Ford, Mike and Judy Elliot and Phil who had obviously got bored with running laps. So, final lap and I was beginning to feel the pain then. Was just so relieved to reach the finish, collected my trophy, bottle of Lucozade drink and voucher for £2 to spend at the burger van. Carried straight on to the van for a cup of tea and tray of chips, and forgot all about stopping my watch! Will have to wait for the results for my exact time, but it must have been under four hours because by the time I realised and stopped the watch it said 4:05, but I'd already finished my tea and chips by then. Boy were they good in the cold! We'd started in sunshine, had some torrential showers (and some super rainbows) but all the time was that biting wind. The rest of the Thompson familly had arrived to cheer on Andrew, who came in a bit after me, and Maggie "I've started so I'll finish" who would never even have dreamt of wimping out before the end. My heart went out to the marshals - Standing around in that weather must have been worse than actually running the race. I think I really must volunteer next year. Thanks to all our support team especially Greta for driving - my legs were so seized up I could barely climb into the car. This is the second time I have done the Jedburgh Half Marathon. I really like this race considering it is all on roads. The course is undulating, on closed country lanes and roads, except for the last two miles that are on a wide pavement. There are lots of trees lining the route which all look very pretty with their autumn colours. Last year I got my half marathon PB here, this year I feel I am a bit quicker and thought it might be nice to go for a PB attempt. However after seeing the forecast a few days before and they were predicting 20mph headwind for most of the second half, I revised my plans to finishing in under 2 hours. When I arrived at Jedburgh it was not only windy but raining very heavily. I could not decide on what to wear but in the end I settled on long legs, long sleeves and my waterproof. Ten minutes before the race started the rain stopped and the sun came out. There was no time for me to get changed so I was stuck with what I had on and felt uncomfortably warm the whole way around. I like the start of this race as they have a group of bagpipe players and drummers, which adds to the atmosphere. The 10k and half marathon both start at 11am. I decided to keep the first half steady in order to save something for the headwinds in the second half. The route took us through the centre of Jedburgh then up on to some undulating country lanes. At about the two mile point, I could see the 10k runners heading back in the opposite direction as they have a turn around point at mile 3 (which looked rather appealing as I ran past it). At about 5 miles I got to see the front half marathon runners coming back in the opposite direction. I got to mile six which took me through a loop of the village before heading back the way I had come. In the village some of the locals had set up a table and were kindly handing out sliced oranges and jelly sweets. I must have taken the firmest jelly sweet ever. I popped it into my mouth at mile 7 just as I turned the corner and was hit was the strong winds. Trying to chew this sweet, whilst trying to breath with the increased effort was difficult but I definitely needed the sugar to tackle the second half. At the half way point I was averaging 8.30 minute miles, however the second half was way slower averaging about 9.40. By mile 8 I was really starting to tired from running into the wind. At about mile 10.5 there is a pretty large hill to add to the challenge of the weather conditions, by this point I was feeling like I didn't have much left so I walked this bit, wondering if I would actually manage to make my under 2 hour target. Popped a couple more jelly babies and then just hung in there for the last 2.5 miles. I was very relieved to see the finish, I looked at my watch and saw I had made it in 1 hour 57. Once over we used to go away for a relaxing weekend, maybe a bit of a walk. These days we work our weekends away to include a race (or two). We’ve been to Harewood House years ago but just around the house and gardens and saw this race come up and thought what lovely surroundings for a race. There are 3 options, the 2 Mile Junior Race (well that’s definitely out), the 10 mile and the 5 mile Trail Races – we opted for the 5 mile. The races are run by Valley Striders and in 2008 after a runner suffered a heart attack at the 8 mile point, the Yorkshire Air Ambulance were called out and the actions of those that supported him until the ambulance arrived saved his life. For this reason in 2009 they decided to share some of the race profits with Yorkshire Air Ambulance. The race is run on footpaths and bridle paths and is quite undulating and not far from the actual Harewood House. We started off on what I can only describe as ankle length grass down through a field then into the woods on a narrowish path but still a bit of room for overtaking and avoiding the nettles. Then it was about a mile long incline/hill until you turned right onto a farm track/bridleway with a nice long downhill stretch and gorgeous views over to Harewood House. Looking ahead I could see a ‘muster’ of sheep running across the path, as I got near all I could see is a large herd heading towards me then quickly diverting off behind. They’d been having a bit of a mad run about moment when Paul had passed them earlier as well. We then headed back into the woods and up another incline (I so need some hill training) once at the top of the hill we turned left and had to keep left as some runners were coming back down. This is where the 3 mile ish mark is and the 10 mile runners carry on and the 5 mile runners veer back. I headed down to where the marshals were standing for the 5 mile runners to do the turn back. I admit I had a slow walk back up but for good reason – I was looking out for Val and Eric and the Sharma’s but they weren’t home. Yes we went past the Emmerdale set (for those that don’t know Emmerdale skip down to the next paragraph). We went past the entrance to the Village and straight past Val and Eric’s house and Holgate Farm (the Sharma’s house) with the Dingle farm in the background and Sharma and Sharma Sweet Factory. Anyway, after that excitement, I said good luck to the 10 mile runners as I passed and headed down another nice but steady on your feet path towards the Estate Offices of Harewood. Once at the bottom of the bridleway you headed up a road (yes up again) and another mile long hill. At the top it flattened out and you had a quick right turn then left back into the finish area. There is something to be said for being near the back of the pack as I was directed the correct way into the finish area, whereas Paul unfortunately headed along the road and came into the finish area in the opposite direction, I’m not sure the marshal realised the mistake until the front runners had passed because as Paul was heading into the finish area one way, the other runners were coming into the field the correct way. He ended up doing an extra 0.4 mile. In all though apart from the mishap at the end for Paul and a few of the other front runners, a good organised run and fantastic scenery and grounds and would definitely recommend it for those who love trail running. 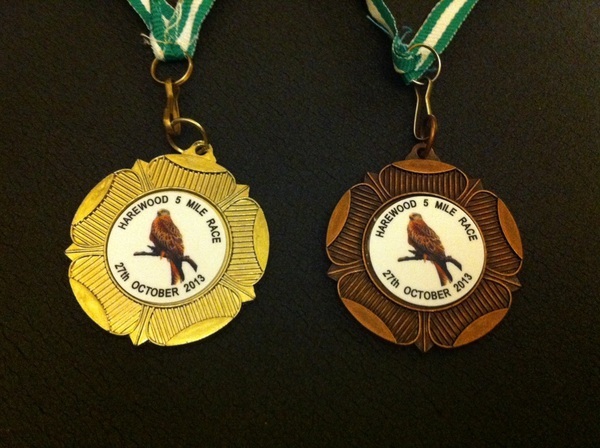 You only get a medal at the end but with half the proceeds going to the Yorkshire Air Ambulance, that is not a problem. Actually the day before I forgot to add, we also had a steady run around Harrogate parkrun. Well we just had to didn’t we seeing as we were down that way. A three lap course of part of The Stray which is mainly flat (I don’t believe races anymore when they say that) with a slight incline on grass and path. A 300 strong field with a variety of runners as usual. The highlight of the morning was meeting Tom Williams and his family, although I admit to using Alistair’s name to get an introduction (well you’ve got to use his fame somehow). They were really friendly and invited us for a post-race coffee afterwards but unfortunately due to having some really lovely B&B hosts we had to decline. Tom Williams of course if you don’t know is the Country Manager for parkrun in the UK and can often be found on the Marathon Talk podcasts which also include a piece from Tony Audenshaw (Bob Hope in Emmerdale). Our B&B hosts had kindly offered to make our breakfast on our return, all the trimmings. So after the run we had a walk/jog back to the B&B, which may I add was 1.35 mile away (so an extra 2.7 mile on the day), had a lovely breakfast and a great day in Harrogate. Another one for the parkrun tourists. 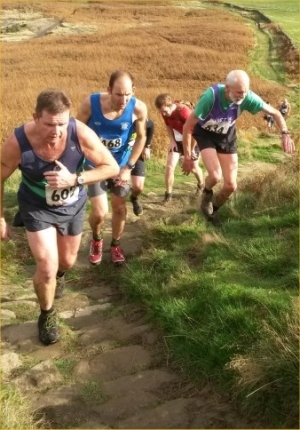 After the anticlimactic finish to the x-country at Blaydon on Saturday I was feeling a little bit like a wound up toy that hadn’t been released so it was with good fortune that the Guisborough Three Tops fell race was the next day and would give me the opportunity to release that pent-up energy. 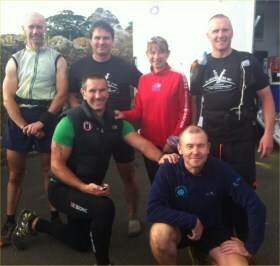 On the start line at Guisborough Rugby Club were fellow Striders, Jan, Mike B, Danny Lim making his race debut and Shaun. Now last year, I huffed and puffed my way around this course in vain pursuit of Shaun who eventually proved too strong to catch and lost me on the final climb up to Guisborough Moors trig point. For those that don’t know, Shaun has a bit of a history in shaking off his pursuers in this race and this time, although I’d have liked to believe I’d have a chance of keeping pace with him, at best I would have just been happy to beat my time from last year. With the worst storm in living memory apparently rearranging garden furniture in the South, the forecast for the day wasn’t too bad, albeit a little blustery and with conditions underfoot relatively ok it was looking set for tough but enjoyable race. A decent turnout for the race meant for a cramped start as the trail narrowed up into the woods for the hard, steep long climb up to Highcliffe Nab. From here the trail opens up onto the Cleveland Way heading to Roseberry Topping. The route then takes a slight detour off the main path through a tight single track which allowed me the opportunity to practice my front rolls. Missing a foothold sent me head first into a ditch but I rectified this with a front roll which those behind me found highly impressive. Despite this little tumble I pressed on. At the approach to Roseberry Topping I showed my true form and took the fell runners line down the side of the stone wall as others made their way precariously down the flagstone path, gaining a few places in the process. (I’m not that good by the way; I just know a good line down this section) At the foot of Roseberry Topping it was head down time for the slog to the summit. The strength of the wind made itself known at the top knocking me onto all fours. Back on my feet I spot Shaun heading back towards me on his way back down. Time for a battle! I touch the trig point and start my descent, Shaun’s about 50 meters ahead with three others behind him, I play my trump card, I have my Inov8 Mudrocs on which have a lovely aggressive sole and I say a little prayer before I go for it, and dash past them all flying past Shaun. Now it’s worth mentioning that he’d told me earlier in the day that descents weren’t his strong point, much like it’s worth mentioning that running fast on flat ground isn’t really mine and before I know it Shaun is whizzing past me again as we turn and make our way back up a steep climb towards Hanging Stone. I keep him in sight, but he steadily increases the gap as we head back up to the final trig point at Guisborough Moor but I’m feeling good and don’t allow him to get too far ahead as the wind picked up and pelted us with hailstones. On the final approach to the trig point I finally seem to be gaining on him again but crossing the moor slows me down and Shaun makes off for the final descent back through the woods. Damn, lost him. The gap seems too big to close now as we weave left then right for the final descent down a steep muddy track. Then when all seemed lost, there he is like Bambi on ice (or mud) slipping and sliding about trying to maintain an upright position. This is it; I have my chance and open up my stride to whiz past him as I make the final dash to the finish. Overall, an excellent day on the hills and as a very muddy but smiling Danny will profess, the quality of this race and the drama it can provide makes it a little bit special. Participation in cross country running in our region has 'gone through the roof' judging by Saturday's HL fixture at Blaydon! Numbers have been growing quite dramatically over the past couple of seasons but the previous record for the Senior Women's field was exceeded by around 50% on Saturday and the men's jumped by around 40% as well! Just incredible, and of course, Striders broke their own records with 20 women and 31 men competing for their club. Gone are the days when it was just a few diehards who braved the mud - X/C now seems to be 'main stream'! So someone must be doing something right somewhere - but success can also bring problems and the organisers (all volunteers) were put under considerable strain on Saturday by the sheer weight of numbers. Nevertheless a great day was had by all in the unseasonably mild weather and on the surprisingly dry course. Striders gathered around the new giant sized club flag that Alister and Jacquie had kindly brought along. The Striders' tent was bursting at the seams with debutants and the old girl looked a little weather beaten among the new marquee style jobs on display that were housing runners from Blackhill, South Shields and even DCH! But our new women were not to be put off by a mucky tent and the formidable four (Helen, Jackie, Kerry and Sarah) joined 16 other Strider ladies on the start line among hoards of runners from all the other local clubs. The course itself was a little shorter 'than advertised' with only one or two muddy patches (in spite of last week's rain) and the 'hills' weren't too slippery this year. So all in all it would be a fairly gentle introduction for our newbies - but would they agree?! 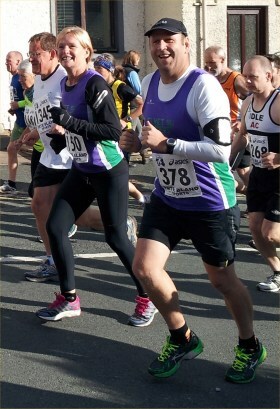 Katy Walton's intentions were clear from the off - she was going for it and she sped off near the front of the field on the crest of a sea of purple and every other colour vest imaginable! 'What Katy did' was to maintain that high flying position and finish first Strider home - well done! But all the other 19 women battled equally as hard with Helen Tones having an excellent debut finishing third counter and Fiona Jones coming in as second counter in only her second X/C race. It was great to see Greta and Anita giving it their all as well as Debs beginning a new comeback trail! I'd like to mention everyone by name but with such a big team there just isn't space - although Rachel Terry deserves a mention for powering through from the medium pack to finish where she did. 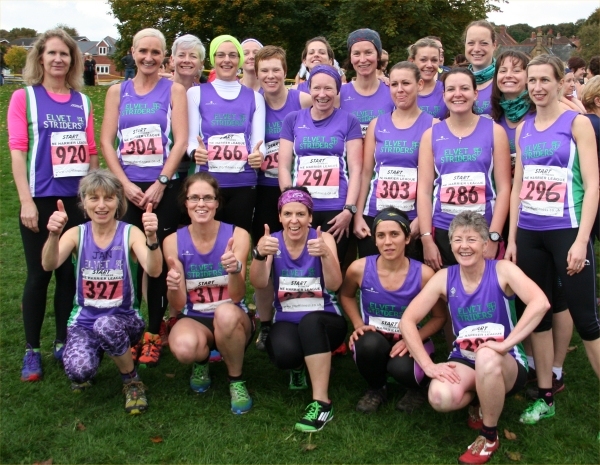 This wonderful team effort resulted in Striders finishing just above the relegation zone in what is a mega competitive Senior Women's Division 1 - it's going to be a tough season! No less than 575 runners competed in the Senior Men's race and it was quite claustrophobic standing in the middle of that hoard as we waited for the starter's gun. After the off it was difficult to get going in such a crowd and there was some 'gentle' pushing and shoving as everyone struggled to get into their stride before the field stretched out a bit. After that it was just a matter of head down and battle round those three laps, watching for the best lines, trying to keep rivals at bay and getting to the end ahead of as many runners as possible - simple! Paul Evans did those simple things the best finishing as first Strider home with Jerry not far behind. Striders had an incredible eight men making their debuts (Dave, David, Innes, Jon, Lindsay, Mark, Mark & Matthew) each with their own tale of effort and sacrifice to tell at the end! It was good to see some old faces out there as well such as Dougie and John Hutch (did you really do a marathon the next day?!) and was that your best ever HL Phil? Well done the lot of you (partic Will and Tom weaving through from the 'Medium') - your efforts were rewarded with 7th place in Division 2 - reasonably comfortable but we can do better and must keep putting out these big teams if we want to do well. Well finally, a big thanks to all the runners and all the Striders that were there taking photos and shouting support (it was like a football crowd in places although much more well-mannered!). Thanks to Roz who was held up in traffic and missed her race and thanks to all the cake bakers - they were delicious! Who knows, I might start watching 'The Great British Bake off' - but don't 'bake' on it!! 575 finishers. Men's team finished 7th of 11 in Division 2. 309 finishers. Women's team finished 8th of 10 in Division 1. We'd left Durham in pouring rain, driven through a deluge and finally arrived at this remote RAF station on the moors with (certainly on my part) some misgivings about the likely conditions we would face when the race started....but then I'm just a novice at this sort of thing and I was assured by my fellow Striders that all would be well. The route covers a mixture of tarmac, forest tracks and rocky roads.....pretty muddy today as well, just to keep it interesting. As it happened, the weather was relatively kind to us; the rain stayed away and the gale only actually howled as we reached the upper part of the course...the rest of the time it was only a gentle in-your-face headwind. Unfortunately (despite being described as "undulating") most of the course seemed to me to be "upper" so I struggled even more than usual. Not long after the start I thought everyone had gone home and left me as I didn't see many other runners till I finally made it back to HQ; obviously no-one else can quite match my ponderous pace. This may sound as if I had a bad day; on the contrary I can honestly say (now that it's a few hours later) that I thoroughly enjoyed the experience. There's obviously a special kind of camaraderie amongst madmen/madwomen who could surely find something better to do on a Wednesday in late October. 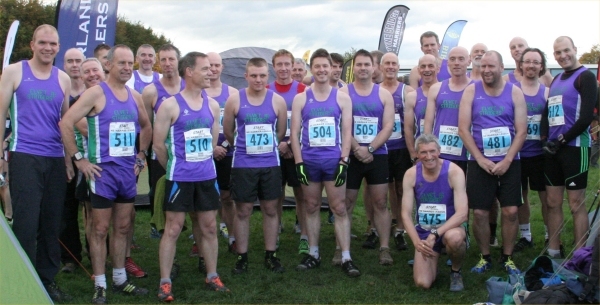 There was a really good turnout from the Striders and it looked as if, apart from the RAF runners, Elvet Striders was the best-represented club there. In terms of performance all the Striders did their club proud (okay, I was a bit slower than most of the others but I did my best....actually only 5 minutes slower than my previous attempts on a much flatter course so I was fairly happy). The facilities were really good. There was a very pleasant post-run reception in the mess with hot food and cheap beer and a generous thank you speech from the station commander.....they breed very young Wing Commanders these days! I'd like to say thanks to all the Striders who looked after me today; it was the first "small" marathon I'd done....unlike the GNR and Redcar there was nowhere to hide! I'll certainly do it again though...it was quite an adventure. I'd also like to record my thanks to Jacquie, Denise and Steph following the saga of my running vest order....they'll know what I mean! I entered this race during the training for the MOTN on a bit of a whim, little did I realise how popular it was going to become. I had a solid enough run at the MOTN following one or two niggles but wanted to give York a real good go. With this in mind I decided to have a crack at the GFA time of sub 3:15 for my age group (41+). Let the training commence. I put together an 18 week training program which mainly consisted of 4-5 runs a week including a long run, a track session, a Parkrun and a couple of recovery runs. In amongst these runs I also entered quite a few races as I find racing really sharpens me up and gives me confidence. And so I arrived at York with recent PBs in at both 10k and half marathon distance. My build during race week slightly altered from previous marathons as I decided to “carb up” more than usual. From the Wednesday onwards I tried to consume 600-700g of carbs per day, seriously who can eat that much food! I eased up slightly by the Saturday as I was completely stuffed! So, with my usual support crew with me (Katy and Heidi) we headed down the A19 on a damp on blustery Sunday morning. We parked at the park and ride and got the bus to the university where the race was to start and finish. The organisation seemed to be very good, especially as this was York’s first attempt at a marathon. 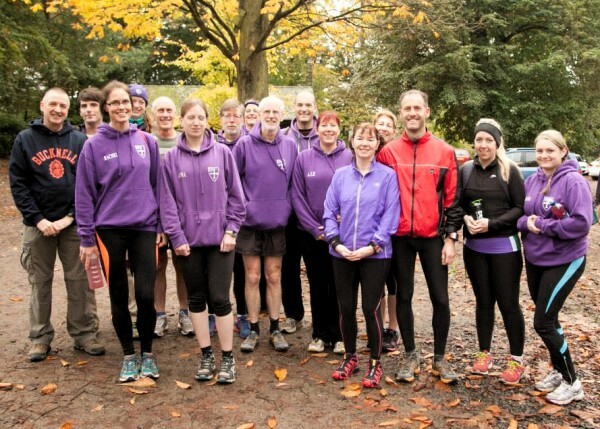 We met up with the rest of the Striders for a team picture before we headed off to our respective start pens. I was in pen A with the fast guys and the elites! After the mass warm up (they’re not for me) and a race briefing it was almost time for the off. Dickie Bird (former cricket umpire & one of my heroes) was one of the official starters getting a big cheer as was Danny Mills (former Leeds United footballer) getting a chorus of pantomime boos as we were in York after all! After a countdown from 10 we were off and running, I was over the start line fairly quickly. Now I had a race plan! 7:15 per mile through the first 21 miles would give me a minute per mile buffer for the final 5 and a bit miles to achieve my sub 3:15 goal. I’d recently ran 7:15 at Redcar Half and felt relatively comfortable so I just had to continue that through to 21 mile and cruise home at 8 minute mile pace, how hard can it be! Fool! Fool! Fool! The first mile was a doddle! As were the next 5 or 6 to be fair as we ran through the city to some fantastic support. We left the city behind as the route took us through lots of villages on the outskirts, again the support was amazing from supporters and marshals alike. The first real tough section for me was at 9 miles where a bit of an incline presented itself, not particularly steep but it was certainly steep and long enough to have me gasping for breath as I reaching the top of it. From there the route twisted and turned on country lanes for a few miles including a switch back in one of the villages giving me the opportunity to see some of the fast guys out in front. I also got a high 5 from Bob off Emmerdale who was behind me on the switch back. I passed through the halfway point in 1:34, slightly ahead of schedule but not enough to worry me, I was however working a bit harder now. The next switch back came between miles 16-20 where I was snapped by Mark Preston (thanks Mark). As I passed Mark on the way back he made comment that I still looked strong however my race was starting to unravel. I got to 19 miles and my pace had dropped, I was struggling to keep it around 7:25-7:30, any slight incline was hurting me and the breeze suddenly felt a lot stronger. Time for a re-calculation to my plan, 7:30-7:40 from here would be adequate for my target time. Oh dear, I was now hurting, each step felt hard. I was at the stage that every marathoner has been at, the “I’ll never run another marathon” stage! At the water station at 21 miles I stopped running and walked briskly whilst I took in some much needed hydration. I had a good talk to myself and came to the conclusion that I only had 5 miles to go at 8 minute mile pace which is nothing more than one of recent recovery training runs! Come on Graeme get a grip! I set off again with this positive mind-set as well as reminding myself how it would feel to cross the finishing line. Katy and Heidi were waiting for me, they would be looking at the clock expecting see me, lots of people were aware of my target, I couldn’t let them down, I couldn’t let myself down! The supporters were willing me on, I guess it was fairly obvious that I was struggling, I passed through miles 22,23,24,25 in pain but still moving forward. Mile 26 was without doubt the hardest challenge of my life. My body was shutting down with my calf muscles threatening to cramp up, the hill just before the finish felt like a mountain! However the top of the hill my emotions changed with a shout from Katy and Heidi and the finish line in sight. 400m meters to go and miracle of miracles I found my legs again, well it was downhill after all. The cheering crowds were simply awesome as I crossed the finish line in 3:13:52, a 5 minute PB and a qualifying time for the GFA category in the London Marathon. I have to admit it was all a bit too much for me and I was quite emotional for a moment or two. I picked up my goody bag and went to find Katy and Heidi getting a massive hug from them both. Wow what an amazing feeling it is to finish a marathon but my word it’s tough. Will I run another? Well London is a must, but following this experience my opinion is that more miles are needed in the training do yourself justice. The organisation for the inaugural Yorkshire Marathon was brilliant and the supporters were truly magnificent, well done York! Well after an anxious night of no sleep I met up with some of the team at 7:45am at DOW and we headed to Gibside. As you can see from the photo we had a fantastic turn out as the sea of purple continually grows! We set off prompt at half 9 and I set myself a nice little pace. First mile was fine and quite enjoyed the scenery. I suppose I should have realised running on a slight decline wasn't going to last forever! Oh and then we met the hills! 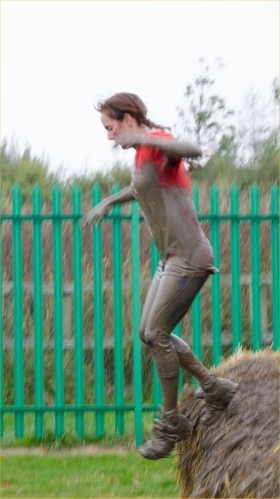 Tough ones, wet and slippery from all the runners with wings :) I do recall at about 4 miles I began to swear at myself for entering and then proceeded to attempt... to run...(fall gracefully) down hill...... Think I established I prefer running up hill! Although my furthest and hardest race so far the route was a beaut, lots of support and encouragement all the way round which kept me going right through to the last straight... Which went on forever....and ever! A group of friends and I ran this race after our post-Total Warrior elation back in Summer. We knew this would be a different challenge, being in October, but I also knew it would be great fun. The day itself was grey and rainy, which only added to the anticipation of what we were about to tackle. The starting area itself was well organized, with announcements and starting waves being announced via speakers. We dropped our bags off easily, and collected our race t-shirt: all runners are given a British Heart Foundation T-shirt to wear. It’s a nice touch, but made it more difficult to spot people you know. As we turned into the woods, having found a really good rhythm,.... Disaster struck! We hit a queue for the first major obstacle. I was running at the front of our starting wave, and we caught up with the previous wave who were still queuing. The obstacle in question was a long muddy ditch, and thanks to the rain from the week, people were finding it hard to actually climb out of the ditch, which slowed things down. We were in the last wave of starters, so I had guessed things were going to be a bit backed up for us. However, we queued about 20 minutes to get to the obstacle, which was too long in my opinion. People started to get cold after such a great warm up, and as we were in the fun-run category which had more amateurs, this wasn’t particularly safe or encouraging. Despite this initial setback, we made it through the muddy ditch and were back running. What followed was 8k of running through uneven fields, in the woods, by roads, leaping over hay bales, running over tyres, crawling through water-logged pipes, and climbing a huge hay-castle. They had my favourite from Total Warrior: a slip ‘n’ slide (as we call it in Australia) down the hillside! The course finished with a mud-finale. Three big pipes, with a mud pool either side. And each mud pool was deeper than the last. I'm only 5'2", and by the third, it was over my hip. To be honest, this is what I love about these courses: testing your speed, strength and stomach. I am the biggest wimp when it comes to jumping in a swimming pool on holiday (what if it's too cold?! ), but seem to have no issues jumping into a pile of mud - and whatever else is in there. Left the house really early as wasn't sure of the logistics of parking, although there were excellent pre race instructions from Swaledale Roadrunners I'm not the best at following instructions. We arrived nice and early and managed to get a parking space in the Market Place right next to race hq. Race HQ was really well organised and I picked my number up no problem and hot a cup of coffee from the little coffee stall in the corner. Unexpectedly bumped into a couple of runners from Run Peterlee which settled my nerves a bit, then Alister and Jacquie turned up too with a couple of other Striders as well. The course was, well, I think hilly is an understatement and I was walking up them before I knew it, mind you, what goes up must come down and there were some nice downhills and flat bits. For most of the race Maggie Thompson and I were playing catch up with each other, which really kept me going, how inspirational is she? Very is the answer. She gave me great advice to save a little bit for the final hill into the castle. The course was well marshalled with a very friendly and encouraging bunch of people who managed to stay cheerful even in the 'kind of rain that gets you wet through' in the words of Peter Kay. Bright yellow kilometer markers, reminders to stay on the left and 'beware runners' were prolific. At about 8km a bystander shouted for me to overtake the man in front of me so round the next corner I started my 'speed up' then I hit another hill, 'the finish is just around the corner but there's another hill' encouraged a Marshall. Really tried to put a sprint finish in the last bit, then I heard the usual Striders welcome from Jacquie and Alister, feeling buoyed up I managed to overtake a couple of other people on the last very steep hill into the castle to the finish line. Found my hubby sampling some of the ales at the festival, I was disappointed that they'd sold out of the Richmond Castle 10k ale the day before. So settled for a hot sugary cup of tea at the bargain price of £1. Maggie did the Striders proud by coming away with a prize, of which there were many. There was no goody bag or t-shirt but we did get a neck tube thingy which is a very useful thing to have. The results were printed up quickly and I was amazed to get a time of 66.24, which is less than a minute longer than my PB at Tynedale, so I am very pleased with myself. I was in two minds about running this race, my Achilles had been terribly sore after the hill session on Wednesday and it looked very doubtful that I would make the start line for Durham parkrun let alone race on the Sunday. I have been having a torrid time with my calf and Achilles. I have been doing eccentric exercising of the calf but doing these puts a lot of pressure on the arthritic joint in my foot and it had started to become very sore so I had had to stop for the moment. In desperation I had a search around at work and got hold of a large piece of solid plastic which makes a brutal but effective foam roller so after much swearing and grimacing on Thursday and Friday I felt confident enough to give a steady 22min parkrun a go and to my surprise my calf felt ok so after some thought on Saturday I decided to give the race a go. The race is part of the Run Northumberland group of races and despite the ridiculous course description of the Prudhoe 10K which I had done recently I signed up for the next one in the series. The race is held near Kirkley Hall which is just past Ponteland (it's really easy to find just drive past the airport into ponteland, when you come to roundabout in the middle of town you will see it signposted). After a very chilly warm up we were sent on our way. I had decided not to push things and split the race into 2 parts. The first 3 mile I was going to aim for a steady 7min miles then if my calf held up push from there. The start is little undulating but the main problem was a strong head wind for the first 3 mile or so. From about 1.5 mile I was with two other runners who I think decided they would sit just behind me and let me take the wind, thanks! Not my quickest 10K by any stretch but I was pleased with how sensibly I ran (for once). A canny race and I will probably do it again next year. I've not written of my orienteering adventures of late. You'd be forgiven for thinking that for someone who orienteers as much as I do that I spend all my spare time polishing my trophies and admiring my medals. But I seem to have had ever such a run of bad luck. It seems to have started about the time I got back into orienteering a few years ago and unfortunately has continued right up to and including the October Odyssey. When the satnav chucked me off the A1 early because of a road closure I found myself looking out the window at a lot of muddy runners being jettisoned out of Newcastle Racecourse, which I realised later was the Stampede in full flow. 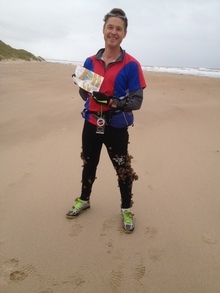 Some time later I'd arrived at Druridge Bay, found the Start, and was being asked if I had a whistle. Indeed I had a whistle, and a compass, and stuff. And then I started. I'm an old hand. I know the temptation to sprint away with a determined and knowledgeable expression on one's face is always a mistake, and consulting the map and finding out where you are is usually a good pre-requisite. I held my nerve, walked slowly from the Start, looked at the map, and worked out where I was. I seemed to be next to a sand dune. Good, good. Now, if I went over this sand dune, I'd get to a flattish bit, then there'd be another sand dune. A bit bigger than the first one. 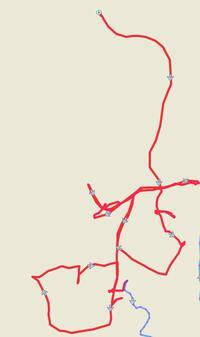 Then there'd be a Clearly Visible Path, with a junction, ah yes, it was all fitting into place. Up over this bit, and the control would be just, over, there. Nope, that wasn't my control. So where was my control? Behind that sand dune? Or maybe next to this sand dune. Or perhaps in this bunker, beside, well, sand dunes certainly seemed to be involved. The wonderful thing about the sand dunes, was there were so many to choose from. Well this was fun. Sixteen Minutes and 39 seconds later, and almost a phenomenal 200 metres from the Start, I found CONTROL ONE. This was impressive. Even by my own exacting standards I had excelled myself this time. I wasn't even out of earshot of the Start and could still hear occasional shouts and cheers as competitors launched themselves into the dunes. I dibbed and dazedly wandered on. A quick calculation that involved multiplying the number of controls by sixteen and a bit minutes made me think that if I didn't get my act together it'd be dark by the time I finished. The main features seemed to involve dunes; big dunes, small dunes, weird shaped dunes, and pretty dunes. I was becoming weary of dunes. I looked for some nice linear feature that I could handrail along. Nothing but dunes, but, hang on, there was a nice handrail. I couldn't be sure, but I think it was called the North Sea. I jogged along the beach for a bit only to be met by a big dug bounding the other way, followed close behind my Mike and Dawn Metcalfe from Durham Fell Runners. Despite realising that I was losing valuable seconds that could make all the difference on the podium between first and last, I stopped for a chat and posed for some photos that demonstrated the remarkable propagation properties of Arctium sp. I mean, your really have got to admire those burdock bad-boys. When they want to get their seed dispersed, they'll stick to anything. I'm sure there are new plants now growing in my washing machine. Some time later I crossed the finish line and accepted my printout without a glance. You'd be forgiven for thinking that I was hacked off and demoralised, because that was exactly what I was. Last again. Quite generously last. And I never wanted to see another sand dune in my life. By the way, if you happen to know any top tips for removing burdock from clothing I'd be most interested. I've tried freezing, soaking, microwaving and ignoring. But, sadly, hand-picking it spike by spike seems to be the only way. That, or incineration. Well I had always been a bit unsure about running this race - it sounded like a bit of a toughy and I'm not really one for training long distances. So I was secretly relieved when it was cancelled back in March! But then they had to go and re-schedule it didn't they!! However, lured by the scenery and the chance for a fun-filled weekend with Miss Bray and Miss Percival and their friend Sarah-Jane, I found myself lining up with nearly 1000 other runners on a beautifully sunny morning in Coniston. Having stuck to my fairly minimalist training regime, which seemed to have worked out ok for previous events, I had no idea of what to expect from my legs on this fine day. The first 3 miles seemed to pass very slowly. I swear I had already run up and down about 25 hills (this is probably the most undulating race I’ve done – the hills are not big but they are plenty) and my legs felt quite lethargic. I started to worry that this race was going to turn into a fairly traumatic affair. But, buoyed by the fact that Miss Percival had not yet breezed past me, I plodded on. And the miles passed….and then cometh the 10 k mark, much to my joy, I realised I was actually doing rather better than I felt I was doing. Sub-2 hours was within my sights and so I decided now was the time up my spirits and push on. To cut a long story short, I finished in 1.58 and was absolutely chuffed – this was much better than I had anticipated and only 2 mins slower than my half marathon PB! Disclaimer: Whilst the minimalist training approach does produce agreeable results, it does result in significant post-race soreness. My recent experiences of The Coniston 14 have been somewhat chequered to say the least. I entered in 2011, after a few years gap, when the race had morphed into the Coniston 17 because of flooding. It was a very hot day in early April and I suffered! I had to be nursed around (dragged screaming??) by Dougie who just wanted a slow jog before London. Then in March 2012, I’d actually trained properly but was smitten with ‘flu, so couldn’t take part. This year the race had to be cancelled because of the horrendous blizzards – first time in living memory I gather – which brings us to this Saturday and the rescheduled race. Unfortunately, we had already planned a weekend in Northumberland. Never mind, I thought, it’s just not to be. No way! Paul decided we would drive down – “We always do a long run on a Saturday, it’s just a bit further to drive!” So we set off from Wooler at 7.00a.m for the 3+hour journey to Coniston. Madness or what?! In the days before the race, I’d become increasingly stressed about getting cramp, following my GNR debacle. So by the time I reached the start line I was convinced I’d seize up at the first corner! But it was a bright sunny morning, there was a definite buzz in the crowd of runners waiting for the off and we were in for some beautiful scenery. So cramp was forgotten – after all, it was just another weekend long run! The course is quite undulating and challenging in parts. The first 3 miles to Torver is persistently uphill with some steep bends before the first water station. 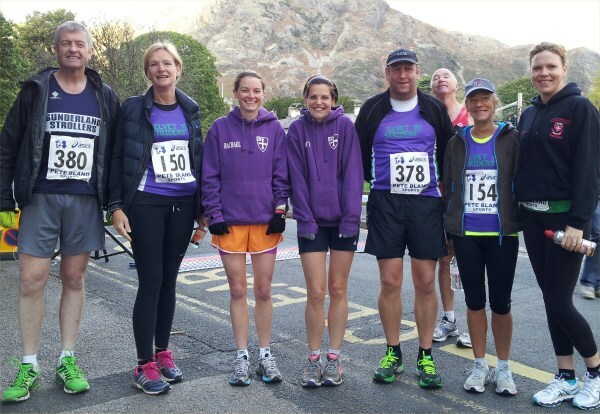 As starts go it is tough – a few had already dropped out at Torver, one woman in tears! I felt ok - especially when Barrie Evans helpfully informed me that I wasn’t last! He was spectating this time. The next 3 miles includes some long downhill sections, gradually leading the route back to the lakeside, where a narrow lane (flood-damaged in 2011) takes you to the other side of the lake. This section is really lovely, especially on such a sunny day. From here the route remains reasonably flat through the trees before a deceptively steep climb up to Brantwood, John Ruskin’s house and some fantastic views of the lake, the mountains and the village. The final water station was here, preparing us for more climbing up to Thurston. This is where you know whether or not you’ve done enough training! I clearly hadn’t although the dreaded cramp did not strike! At Lanehead the course starts to drop down to the Head of the Lake and that long flat run in to the village. I was very tired but still running – well, jogging – after a fashion. I knew my time was going to be slow but it didn’t matter. I enjoyed the race and I knew I’d feel ok after a pint of lager! The spectators were fantastic through the village, shouting and cheering for everyone, which kind of raised your game. I saw a few other Striders at the finish and then we headed off to the pub before the long drive back to Wooler. The Coniston 14 was voted Britain’s most scenic race a few years ago by readers of Runner’s World and so it now attracts competitors from far and wide. Entries will be open soon for next years’ event so, if you’re up for a challenging road race in a beautiful part of the world, why not enter? This was my first marathon, it was not intended to be my first. 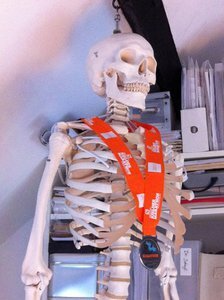 I had signed up for Edinburgh 2013, completed the training, the long 20 mile runs, then fell at the last hurdle, a nasty virus hit me one week before the big day, knocking me out of action for over a month. Devastated, but unperturbed, I picked myself up, dusted myself down, and signed up for Kielder. Once more I began a gruelling 18 month schedule. Thankfully this time the seasons were on my side, as most of my runs are on an evening, the lighter nights allowed me to complete my weekday runs on Waldridge fells, with a handful of long runs, including a final 21 miler, along the beautiful Northumberland coastal paths. The day soon arrived, the combination of hilly fell runs, and long undulating coastal terrains ensured I was fit, strong, and ready to respect the challenge of the Kielder marathon. And so it was I set the alarm early. Too early it seemed as I sat attempting to force porridge into my face, under the bemused glare of a hound in slumber. 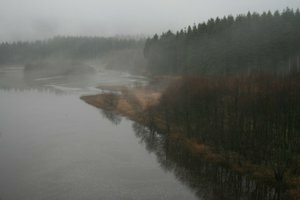 After packing, unpacking, rechecking, removing, checking again, and one final time, I loaded up the truck and set off on a solo road trip to Kielder. It was a fine drive down, quiet and peaceful. With music my company, I focussed on my months of training, played back recent races and psyched myself up. Made my way to the free park and ride service, and used the first of many available portaloos. The bus ride was filled with sombre looking faces as we rode across the dam, the 18 mile marker teasing us unapologetically. Alighted the bus, located a second group of portaloos, then delighted to meet up with fellow Striders huddled over teas, coffees and various pre-marathon snacks. One hour until race start. I felt the atmosphere before a marathon was somewhat subdued compared to shorter events, it was serious, anxious, and curious. Half hour to race start, I made my way to the secure baggage area, changed, considered sleeves, declined sleeves, checked Vaseline was applied, applied some more, then reluctantly made my way outside, to portaloo number 3. Met up with concerned looking Striders on the start, with Bill cajoling us into believing we were having a good time. Without warning the horn sounded, a shuffle, and I made the first steps on the marathon. A steady pace, run slower than I want to I thought, shoulders relaxed, we're good to go. And go we did. We stayed in a group for the first mile, dodging other runners so I didn't become separated from the clan. The crowded runners began to thin, and I settled into a comfortable pace. A pace I noticed not too far behind Juliet, I made a conscious decision to stay near, knowing our previous times were pretty similar. The first few miles ticked over nicely, and very soon we had reached 6 miles, only 20 and a bit to go I thought. I remained with Jules as 10 miles came and went, by now we had swapped game plans, previous race histories, biographies, favourite pre-race meals, top 5 artists, and a brief rundown of how we ended up running around Kielder reservoir in the rain. She also uttered something about incessant babbling, but I didn’t catch that, I was too busy running a marathon and trying to breath. We soldiered on. Halfway. Wow. This was actually happening! Look ma, I'm running a marathon! And into no man's land. I had read about this in my 'Big Book of Marathons', the period between 13 and 20 miles, where you are tired, yet still with a long way to go, too early to start thinking about how long is left. Time to focus on posture, form, pace. I followed my game plan, which was to take a gel every 5 miles, this seemed to be working well. The constant undulations coasted us past more mile markers, numbers, just numbers now, every now and then. We approached the dam, strange to be running on flat road after the soft cushioning of the tracks. After the dam was a very welcoming spectator point with buses and cheering, jelly babies and water. We picked up pace and smiled, although reminding ourselves we still had 7 plus miles to go. But we were in it now, deep inside the belly of the marathon. Still running together, still running strong. 21 miles passed, this was it, I had never ran over 21 miles in all of my running life. I waited in anticipation for something to drop off, a leg perhaps. It didn't, there was a questionable incident occurring inside my shoe, which I briefly brought to the table, but we chose to ignore it. Now, now we can start the countdown, now we can read the numbers. Now the race was inside our heads (it was mine anyway, Jules seemed quite happy jogging along discussing the merits of her granola bar, my Kendal mint cake, and our collective inability to see anything through the rain). 22 miles came, by now my thighs were screaming, my toe throbbing, something was happening in my hip but I couldn’t figure it out, again one to ignore. A tactical walk here, up a steep zig zag path, I urged Jules to go ahead, surely I was holding her back, but thankfully she stayed, I may have just curled up right there had she left. 23 miles, the numbers are on our side, just a parkrun to go, this didn’t help, as between us we had completed one singular parkrun. Never mind, not the point here. And here we are now, 23 miles into our marathon discussing why we have only attended one parkrun, too many excuses to name here (namely both afraid of fierce competition that early on a Saturday, combined with a choosing of a steady fell run at Waldridge, shh, the marathon!). Something happened here, ah yes, we caught up with Andrew, we chatted about times, I grunted something inexplicable about just wanting to finish, until he sped off again into the woods. That’s part of the beauty of this race, the woods, the landscape, you become one as you run, as it shelters you and offers protection from whatever demons you’re facing. 20 minutes to go. 20 more minutes of running, more numbers. We had picked up pace now, 25 miles past. A spirituous sight. Our pace remained ,we were again strong. 10 minutes left of running. Jules talked of adrenalin, how it will come back and carry us, I waited for its arrival. A sign for 800m, here it was, the adrenalin, so welcome. The pain subsided as we seemingly flowed through the woods, we could hear the crowds, the cheer, the loudspeaker. The woods turned into a path, a hill, we powered up it, the sudden incline not effecting our pace. Suddenly a voice, “come on, get up that hill”. It was my dad, the original marathon runner. I recognised his frame emerging from the shadows, his voice inspired me as I fought back tears, as we pushed on, I heard my wife, then my mother, their welcome screams recognisable through the heavy crowds. Our pace was swift now, the narrow finishing straight acting as a stage for every runner, each with their own stories and pain. Jules and I sprinted together, and crossed the line together, just as we had started. Time on the clock 4 hours 18. It was over, it was done. The months of training paid off, the course challenging, tough, but fantastic. The organisation unfaultable, with its plentiful water stations and encouraging marshals. Congratulations also to Camilla and Anita, who completed their first marathon in arduous conditions! Had I not ran with Jules, or more so had Jules not stayed with me, I'm certain I would have added 30 mins onto that time. And I'm honoured and thankful that she became such a massive part of my first marathon, she was a truly fantastic running partner. I certainly wouldn't have enjoyed it half as much. Enjoyed, interesting word, but none so truer. I was proud of myself, proud of the dedication, proud I had done it, and done it well. Proud to wear the Strider colours. This was my first marathon, it certainly won't be my last! I couldn't really resist the title of this race but was slightly disappointed to find out it is just named after the woods rather than evoking descent into the fiery pits of Stanley. I've never done a trail race before so was a bit nervous about what to expect but was at a loose end so thought I would give it a go. I cadged a lift from Alister and Jacquie (thank you!) and we arrived at the Louisa Centre in time for a natter and some coffee with some of the other Striders. After some busy races (I'm looking at you GNR and Redcar) it was such a relief to be able to use the bathroom facilities without queueing and we even had a load of seating and a table at our disposal. Managed to enter fine on the day too - the organisation really was very good the whole way through. Barring a few muddy parkruns and the recent XC cup fixture my trail shoes haven't seen much action, a fact which became evident when I went to put them on just before the race and realised I'd not brought my insoles, argh. Still, after some DIY on the insoles in my other shoes and the obligatory purple photo we lined up and were off! The first corner turned into a huge bottleneck as the path was pretty narrow but the hill afterwards thinned the crowd out a treat and I find it's always quite nice to be forced into pacing yourself early on so the inital crowding was actually a good thing. The course was a real treat actually, along the old railway path for about 4km, then down into the Hellhole (woods) and some proper off-roading before heading up the other side of the valley again. Derwentside had cunningly spray-painted all the tree-roots and stones white which really helped with footing and it really wasn't too muddy either, in fact picking my way through mud and nettles and puddles was just the thing for taking my mind off the hills and the 4km or so off-road was great fun! The last 2km were not as much fun, as it was mainly up a massive steep hill but then the last bit was a big downhill sprint before finishing on the field where the sea of purple at the end from those who had already finished was a welcome sight as usual! Blackhill Bounders ran away with the ladies team competition but I think we didn't do too badly (well done Fiona who was first Strider lady home and 9th overall ... and a big well done to Gareth who was 8th overall). Also a massive well done to Sophie and Laura who were running their first trail race for the club and acquitted themselves excellently. No time for a post-race drink unfortunately as we had to dash off to try and catch Jon who was doing Etape Pennines (we missed him but saw a grinning Dougie!) but as I said before I couldn't fault the organisation, the marshalls were all really friendly and there was a top goodie bag too - t-shirt, two bags of haribo, a packet of crisps and a mars bar. This is one Hellhole I will be happy to descend into again! I seem to do a lot of Mountain Rescue fundraisers lately. On September 1st I race-directed the Hardmoors Princess challenge 30 mile race, the Hardmoors team put together to raise funds for Scarborough & Ryedale Mountain rescue (we raised £1050 I’m pleased to say and this will now be an annual event). Next up was the Viking chase with Shaun (fancy the webmaster forgetting to put a report in [Didn't forget, mate ... I was waiting for you! Ed. ]), another fundraiser but for Cleveland Mountain rescue this time and then this one back raising funds for Scarborough & Ryedale. Got a lift down from friends Dave H and Darren B and to be honest if they hadn’t arranged to pick me up I would not have gone as I was decidedly ropey. Unfortunately we were late to the start at the tiny little village of Stape in the eastern part of the North York moors and while we filled in our EOD forms the rest set off leaving us rushing after them. The race had a change of course this year I believe due to a shoot happening somewhere. Up a tarmac road, that I hated then onto the moors and onto Wheeldale road, thought to be of Roman or possibly older origin. 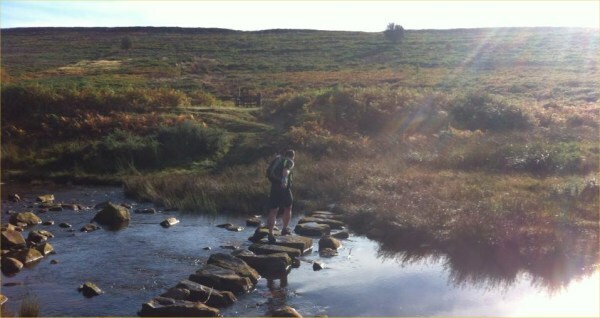 This led onto some picturesque stepping stones at Wheeldale Lodge and a steep climb. This seemed to be the only part of the course that was fixed. At the top of the hill there was some discussion as to which way to go. The map it seems was only a guide and a poor one at that, something my running partner with full on OCD was having trouble with. While discussing the way a lady came up behind up and was adamant we could cut a good ten minutes by heading through the heather. This seems a little like cheating to me but it led to a track with a fantastic view of the North Yorkshire railway. This steam train travels from Whitby to Pickering and we would spend the day being teased by its Hollywood film soundtrack tooting and chugging but not getting a glimpse of it. The next turn, up through the wood or the grassy track it was apparent that knowing the best short cut was a game everyone was not only playing but revelling in. Kudos seemed to go to the person with the best shortcuts and this time it was the woods. (15 minute saving apparently). We came out of woodland to find our mate Dave H who was way ahead of us just behind us saying he didn’t want to talk about it and off he went into the distance again. (And Dave has done the race a few times before! ). Daren was keen to give chase while I was thinking it might be a good idea to stay with shortcut Sally! Not one to leave my OCD mate we picked up the pace pulling away from Sally and another couple of guys that also seemed to know ‘alternative routes’ and quickly went wrong missing a turning in the woods (later the old guy says , ‘knew you would’ ! ) and adding a couple of miles. So it went on, beautiful landscapes , runners popping up in front of us who were miles behind and my mate Darren sticking to the map. We were rewarded with a glimpse of the steam train which allayed my fears they had loudspeakers across the moors just playing a soundtrack , through the beautiful Levisham station and back to Stape (not taking the route across the moors that everyone else seemed to take and I’m told cuts off a full mile ! ) meeting the old guys who were miles behind us asking ‘what kept ya’. Great turnout by the Hardmoors family ,excellent friendly race and loads raised for the Mountain Rescue which is what it’s all about.